Summary from Goodreads: In this seductive follow-up to Poison Princess, #1 New York Times bestselling author Kresley Cole takes us deeper into the dark world of the Arcana Chronicles. I really loved Endless Knight, but there were a few things that made it less than a 5 star book for me. This book picks up right where Poison Princess left off. Evie has just transformed into The Empress and rather brutally killed one of the Arcana. Her newfound friends are awed and, especially in Jackson's case, somewhat terrified. But, Evie doesn't want to play the game she's discovered that she's meant to be a part of - she doesn't want to kill the other Arcana or be killed herself, so she allies with several of the Arcana, making each of them vow that they will do their best not to kill anyone except for Death. But Evie soon finds that she and Death have a history she can't remember, and he just might want revenge - or something else. Not enough Jackson. Jackson spent the first part of this book feeling more than a little bit freaked out by Evie and, once he got over that, it wasn't long before Evie and Jackson were separated. So, I just didn't feel like I saw enough of the Jackson that I loved in the first book. I found myself kind of rooting for Death in this book, when I really wanted to love Jackson. Then, at the very end, Death does something that Evie probably won't be able to forgive and I guess we're supposed to root for Jackson again, but I just wasn't sure I was there yet. It was a little bit frustrating. Death. Like I said above, I actually found myself kind of rooting for Death in this book. He turned out to be nothing like the Death that Evie (or I) expected and I felt really, truly, horribly sorry for him most of the time. I kind of found myself thinking, "Jackson who?" because Death had been dealt a really bad hand (pun intended) and was just trying to survive and not have his heart ripped out once again. I mean, he didn't ask to be Death - it's just who he is. I loved Death and kinda sorta don't want Evie to betray him. Lots more Arcana. I loved that we got to learn LOTS more about the Arcana and see them in action. I also loved learning more about Evie's past lives and about the game itself. The action in this book was exciting (though not constant - some people might wish there was more, but I was happy with it) and we started to understand a lot more about Evie's abilities (and her weaknesses!). 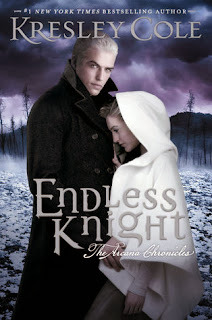 Fans of Poison Princess will love Endless Knight. Can't wait for book #3!! 4/5 stars.